Keeping your home at pleasant temperatures all year long can sometimes become challenging when your HVAC unit is not working at its best and starts to give you issues. We may not be completely familiar with how the system works and how to maintain it, but there are a few tasks we should take care of to make sure the HVAC unit is working efficiently, which could save you lots of money in the long run, not to mention that an efficient HVAC unit is good for the environment and for your health. Change the air filters. Since your HVAC unit is running pretty much all year long, it is necessary to change its filters at least every 3 months, or depending on your personal needs, to get rid of dust, hair, and other debris that accumulates inside. If you have pets, chances are you will need to do this more often. On the other hand, some newer HVAC units do not need such frequent filter changes. Consult with your provider for the specifics of what your unit needs. Set your thermostat at the right temperature. This is one of the most important aspects when it comes to ensuring the longevity of your HVAC unit and how much you can cut off your bills. Sometimes when we want our house to cool down or heat up quickly, we will set the temperature to a much lower or higher temperature than what we are actually trying to accomplish, thinking this will make it cool or heat up quicker. However, this is not the case and we will only be pushing our unit to work longer and harder. It is best to set it at normal temperature and wait for it to work its way up or down normally. Clean the outside unit. Sometimes the airflow can be blocked or reduced because the outside unit has accumulated too many debris. Take some time once a year to clean the outside unit, after powering off, with a garden hose. Check and protect the ductwork. Air can sometimes escape through tiny holes or leaks in your ductwork. 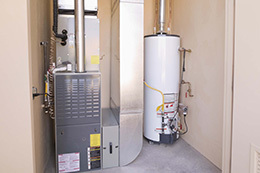 You should check it to see if any cold air is coming out and if it needs replacing or repairs. Flexible ductwork will last less than metal and will need to be replaced if it has holes; metal ductwork can be repaired sealing the cracks with duct tape. Consider getting extra insulation wrapping with foil backing to protect your ductwork from high temperatures and make it last longer. Check the air ducts. Do regular inspections of the air ducts to see if they are not blocked or dirty. You can have them cleaned by an expert or try finding simple tips for you to clean them yourself. Check your thermostat. You will need to determine if your existing thermostat is working for you. If you have an older system that doesn’t have one included, your best choice is to invest in a programmable thermostat that will help you set specific temperatures throughout the day and as the seasons pass to adjust to your needs. If you are away from home often, this will save you hours of operation and therefore hundreds of dollars a year. Check temperatures in every room. You will notice whenever you enter a specific room it might not be the same temperature as others in your home, which would mean the air is not flowing evenly. In this case, it is best to call a professional to check your unit since it might not be working properly. Check your calendar. This might seem quite obvious, but we tend to take for granted some appliances we have in older homes and simply keep them for too many years. If your HVAC unit is older than 10 years, it might be time to consider getting a new one installed, since the old one might still work with methods that could even be harmful to your health and the environment, and use up much more energy than new devices do. You will only need a room thermometer or even a digital meat thermometer from the kitchen should work. You can determine the efficiency of your unit by comparing the temperature of the air blowing out of the vent to the temperature of the air going back in. Just make sure your A/C has been running for at least 20 minutes to perform the test. Hold up a thermometer in the airstream until you get a consistent readout or set the thermometer on the supply register that’s closest to the inside cooling equipment and keep it there for about five minutes. Do the same in the return vent. Compare both temperatures. The air coming out should be 14 to 20 degrees cooler than the air going in. If you find an abnormal reading after a few tries, it could mean that the unit is low on refrigerant or needs professional maintenance. Avoid having issues with your HVAC unit when extreme temperatures hit and you will need it to be working at its best. Follow these guidelines and be sure that you are providing your home with the most efficient system that keeps you comfortable all year round.